Sri Lanka Telecom (SLT), the nation’s number one integrated communications service provider, presented Braille books to the School for the Blind at Ratmalana, a branch of Ceylon School for the Deaf and Blind under its book programme ‘Spreading the wealth of knowledge,’ which is currently in its sixth consecutive year. Chairperson of SLT Leisha De Silva Chandrasena, handing over the braille books to Executive Director, Ceylon School for the Deaf and Blind Lucien M.C. Perera. (From left) Vice Principal/School for the Blind at Ratmalana Kusum Wickramasiri, Principal/School for the Blind at Ratmalana Sandya Kotuarachchi, Country Representative The Asia Foundation Nilan Fernando, and Director ‘Books for Asia’ in Sri Lanka Anton Nallathamby. The programme is part of the long-term partnership with the Asia Foundation in Sri Lanka to distribute a wide range of books to libraries across the country. Chairperson of SLT Leisha De Silva Chandrasena, along with Country Representative, The Asia Foundation Nilan Fernando, handed over the Braille books to, Executive Director, Ceylon School for the Deaf and Blind Lucien M C Perera. This is the first time that a book presentation has been made to the School for the Blind by SLT, and it is also the first corporate entity in Sri Lanka to fill the libraries with books in Braille. This initiative is also part of the company’s efforts to minimize the gap between the differently-abled community and other people in society, helping to educate them as well as bringing in the necessary technology to enable easier access to information. Speaking on the significance of the book programme, Chairperson of SLT, Leisha De Silva Chandrasena said, “SLT has been seriously considering the ways in which we can uplift society as a whole. Adding further, Executive Director, Ceylon School for the Deaf and Blind Lucien M C Perera said, “I am truly grateful to Sri Lanka Telecom as well as the Asia Foundation for conferring books to our school. The world over, most deaf and blind people rely on technology for communication as well as achieving independence. Information Communication Technology (ICT) training is one of the most effective ways in which we can assist differently-abled people, with assistive and adaptive technology that enable them to use a computer. With the creation of devices that produce books as well as others that allow people to read information on computers and the internet in Braille, modern technology has come a long way. These allow people who are fluent in Braille, to complete their schoolwork, take care of personal duties as well as work. With the objective of ‘Spreading the Wealth of Knowledge’, Sri Lanka Telecom and the Asia Foundation embarked on a book programme in 2003 as a part of the foundation’s ongoing ‘Books for Asia’ initiative. Thus far, SLT has supported by distributing more than 100,000 books per year to schools, universities, professional institutions, libraries and other government education institutes island-wide. The subjects are as diverse as science, geography, art, engineering, and english amongst others. This is a part of the company’s continuous support of the country’s educational institutions and its youth to build and further develop capabilities through the provision of books and other educational material to schools, libraries and other learning academies which will undoubtedly enhance the proficiency and skill levels of schoolchildren, university students, professionals and others. Aramex Sri Lanka in collaboration with its Singapore and U.K offices coordinated and provided Logistic solutions in air and ocean freight services for the silver medalist - Borneo Exotics Sri Lanka at the Singapore Garden Festival. Aramex was pleased to be a part of the operation of this event which brought in much fame for Sri Lanka. Congratulated by Singapore’s Minister Mentor. This event is probably the most exclusive Garden Show in the world; the Singapore Garden Festival pits the best of the best of the world’s top award winning garden designers against one another. The designers are selected for their previous achievements such as multiple Gold Medals at top garden shows such as the renowned Chelsea Flower Show and other major shows around the world. Designers Diana Williams and Robert Cantley from the Sri Lankan company Borneo Exotics (Pvt) Ltd staged a 100 sq. m Garden called ‘Season of Mist’ which was entirely constructed in Sri Lanka before being containerized and shipped to Singapore. The main plants exhibited were Nepenthes, all multiplied in Borneo Exotics laboratory, grown in their nurseries in Sri Lanka and then shipped and exhibited, straight out of the box in perfect condition. This was made possible thanks, to the dedication and care of Borneo Exotics’ Sri Lankan staff and the professionalism of Logistics Partner ‘Aramex’, who handled all the logistics for this complex exhibit. 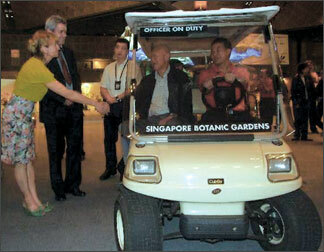 Held in the massive Suntec City Convention Centre, the show attracted more than 300,000 visitors over 8 days, which is 50% over the target of 200,000 set by the organisers. By comparison, the Chelsea Flower Show boasts only 160,000 visitors over the same period. Many dignitaries visited the show and congratulated the designers in person, including Singapore’s ‘Minister Mentor’ Lee Kuan Yew and the Indonesian President Megawati Sukarnoputri. Billed as one of the 10 must-see things to see at the Festival by the Singapore’s leading newspaper, the ‘Straits Times’, Sri Lanka’s exhibit ‘Season of Mist’ combined magical fantasy with the largest exhibition of Nepenthes plants ever shown. The theme of the exhibit was to celebrate the life of the 17th Century botanist George Everhard Rumphius, who made the first ever scientific description of a Nepenthes plant as well as publishing 8,000 other descriptions of plants. The figure of Rumphius himself was represented by a wax effigy created by craftsmen from Madam Tussauds in England and transported to Singapore by perfect condition courtesy of Logistics provider ‘Aramex’. He was a big hit with the visitors as he was so incredibly lifelike! ‘Season of Mist’ also highlighted the plight of many species of Nepenthes which are facing imminent extinction in the wild due to habitat loss and the important role of artificial propagation as the only hope for their survival. DHL, Express and Logistics Company recently celebrated ‘DHL Volunteer Day’ in the Asia Pacific region, encouraging the spirit of volunteerism among employees. The DHL Express Sri Lanka Team at the Dharga Town Government Hospital. A division of parent company Deutsche Post World Net (DPWN), the world’s sixth largest employer, DHL called upon employees in Asia Pacific to demonstrate the true spirit of corporate social responsibility. 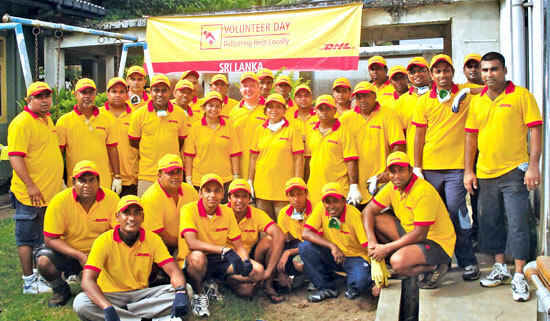 As part of ‘DHL Volunteer Day’, 31 DHL staff in Sri Lanka together with other 15,000 employees in over 20 countries in Asia Pacific jointly volunteer time and effort towards various local causes earlier this month. The DHL Sri Lanka employees were involved in the complete renovation of Ward 02 of the Dharga Town Government Hospital. Country Manager, DHL Express Sri Lanka Martin Dudek, said, “Our volunteers spent two entire days at Dharga Town cleaning, repairing and painting beds and cupboards in the hospital under the guidance of the hospital authorities. I am proud to say that our staff showed a great interest in this initiative and tirelessly worked towards its success”. Across Asia Pacific, DHL offices partnered with local NGOs and welfare organisations to collaborate on projects. Environmental protection featured strongly in the choices of NGOs and projects employees chose to partner. Clean-ups in public parks and beaches took place in Australia, Japan, Korea, Singapore while replanting of trees and mangrove saplings took place in Indonesia, New Zealand and Singapore. Health and education of children and young adults were the common themes across India, Malaysia and China while projects involving orphanages took place in Taiwan and Malaysia. “People are the greatest resource of any business. As one of the world’s largest employers, the combined effort of our staff across the region can create a tremendous positive impact on local communities,” said Dan McHugh, CEO, DHL Express Asia Pacific. Bojoon.com teams up with Browns Beach Hotel, Negombo to explore the future of our fish industry. Sri Lanka until very recently had strong reservations about meat consumption, says the executive chef of Browns Beach Hotel, Jagath Senevirathne. This is partly due to the Buddhist influence, but also due to other factors. Chief among these factors, he elaborates, was the Royal decree that forbade man from harming plant or beast in the forests. Other than for simple tasks such as wood and herb gathering, the common man was not allowed into these forests. These forests were protected so diligently because these acted as a sponge to the heavy rainfalls that the monsoons especially brought, preventing both floods by breaking the waterfall and overfeeding the rivers and draughts by continuously feeding the rivulets in a steady trickle. It also stopped water seeping between rock and soil and thereby prevented landslips. Even the beast was protected and only the Royalty had the right to hunt in these protected forests. Then the ancient holistic medicines, ayurveda, followed by the Sri Lankan also discouraged the regular consumption of meat. This medicinal approach strongly believed that the final moments of the animal to be slaughtered is so stressful that it generates an excess of certain hormones that is actually harmful to the human. However, it is ironic, notes Chef Jagath, that Sri Lankans did not have the same compunction when it came to fish. 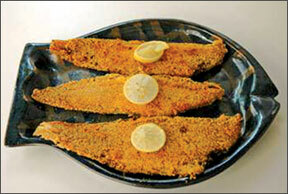 In fact, even today many who claim to be vegetarian consume fish without a second thought. Fish, for some peculiar reason is not considered as meat by many in Sri Lanka. Even a supposedly one hundred percent vegetarian meal is rarely pure vegetarian for many add a sprinkling of maldive fish to the curries, sambols and mallums. Perhaps because of the unavailability of meat and perhaps because of the ready availability of fish, fish became such an accepted component in everyday meals muses Jagath. Unlike meat, fish is plentiful in the tiny tropical island of Sri Lanka, which is surrounded by the sea and the inland is richly veined with waterways, rivers and even manmade ‘oceans’. In these water systems thrives a distinct aquatic life that has contributed a variety of fish to our Sri Lankan cuisine. The fish in Sri Lanka are thus categorised distinctively as produce from the sea and lake fish. Sandwiched between the lagoon and the sea, Negombo is one of the best places to understand the significance of fish in the Sri Lankan economy, notes Jagath. Join Daily News as bojoon.com explores the fish industry in Sri Lanka with Browns Beach Hotel, Negombo. Share your own opinion by simply dropping an email to [email protected] For more information of who we are, do visit www.bojoon.com. The American Chamber of Commerce (AMCHAM) of Sri Lanka will hold a unique half-day Forum on September nine at Hilton Hotel on the theme of Managing IT Operations: Best Practices and Trends. Speakers Jeff Watts (Senior VP, AIG, New York), Deny Rahardjo (Area IT Manager - Asia Pacific, Microsoft, Singapore) and B. Raghunandan (Consulting Manager, Computer Associates, India), will share tools that address how operational excellence in information technology can be used to increase productivity of IT operations and increase return on investments and drive business strategy. The speakers will be joined by Madu Ratnayaka (General Manager, Virtusa) for an interactive Panel Discussion. Executive Director, AMCHAM Gordon Glick, said “investments in IT have become so critical to companies that CEOs can no longer afford to ignore IT operations. “They should strive to use IT as a competitive business tool and use IT Professionals as full business partners”. He said “operational excellence in IT will eventually lead to creating competitive advantages for business”.